Ico is a cult classic that originally released for PlayStation 2 back in 2001. Now, 14 years after its debut, a treasure trove of deleted scenes has been discovered. There's a total of 77 unused subtitle cards found from deep within the game, as Siliconera reports, and a good portion of them ended up containing important information that revealed expository moments in-game that, even now, open up a new world of understanding for players who have been examining it for years. 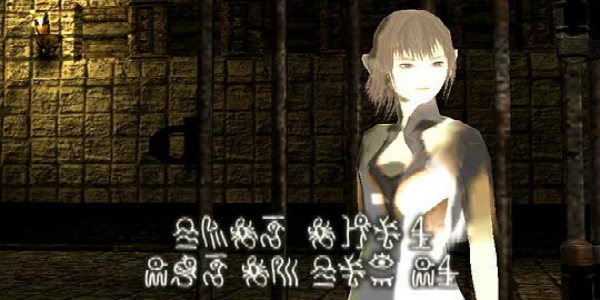 The uncovered scenes add tons of engaging moments to Ico that players have had to fill in with context clues, such as the dialogue between female protagonist Yorda and her queen mother, and the very language Yorda and her mother speak, known as "Runic." One of the main themes of Ico is language, and according to translator GlitterBerri, who painstakingly analyzed the Runic subtitles in the unusued slides, it's a very nuanced system. It's created by "writing Japanese words in the English alphabet, omitting several letters (mostly the vowels), reversing the spelling of each word, and pronouncing the result." The Western version of the game did not ship with Runic subtitles, and thus gamers were unable to translate them or even see them, for that matter. Many of the cut scenes were left without context because of this. You can get a feel for this in the video below. These translated scenes, which are all detailed at GlitterBerri's site, add another dimension to the game that previously didn't exist, and it's amazing to see such a well-loved game being shown this type of attention by fans after so many years. It's still puzzling, however, that these scenes weren't used in the first place, as they would have offered a lot of context for players and expanded the already threadbare story even further. While many will argue that Ico is perfectly adequate and touching as-is without any additional scenes or translation information, I can personally attest that these scenes added another layer of understanding for me, and I surmise it will touch fans across the globe as well. You never know what's waiting out there within the bowels of your favorite game. You just have to dig, dig, and dig some more.